The proportion of colleges and independent learning providers (ILPs) ordered to improve by Ofsted is on the rise, FE Week research has found. Sector bodies have raised concerns the trend in results so far this calender year versus the same period last year is evidence Ofsted has raised the benchmark for FE providers — or is failing to measure them appropriately. Analysis by FE Week revealed of all 57 general FE colleges, sixth form colleges and ILPs inspected and reported on between January 1 and May 5, 33 per cent had their Ofsted rating changed to a grade three, or ‘requires improvement’. For the same period last year that figure stood at 17 per cent of 64 inspections. 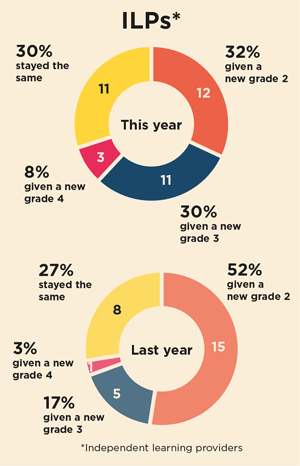 The newly-awarded grade threes all represent a drop from a grade two, apart from the grade given to A4e last year, when it had worked its way back up to a grade three. 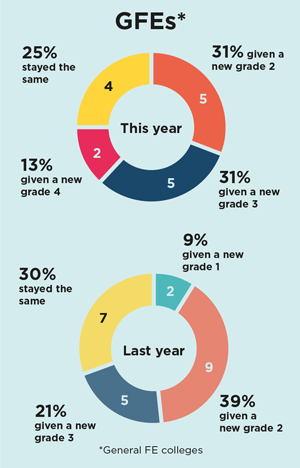 The proportion of new grade one results fell 3 percentage points, with no new grade ones so far this year compared to two in the same period last year. 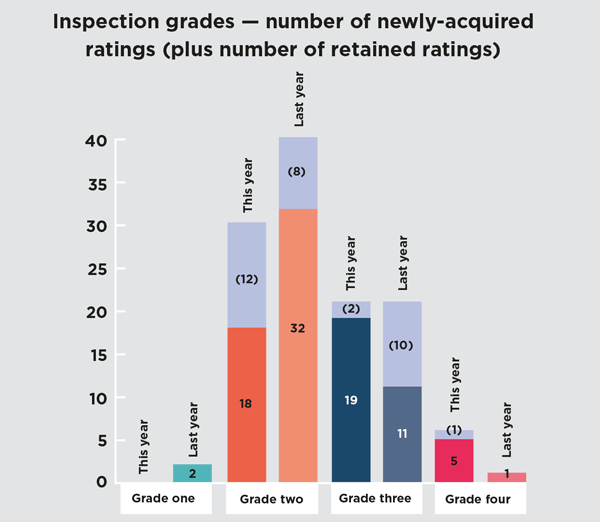 And new grade two ratings as a proportion of inspection results fell from 50 per cent last year to 32 per cent, while the proportion of grade fours went from 2 per cent to 9 per cent. For general FE colleges, 31 per cent of the 16 inspected and reported on so far this year dropped to a grade three, up from 22 per cent. Mr Corke said the new framework “should better assess the complexity of colleges”. 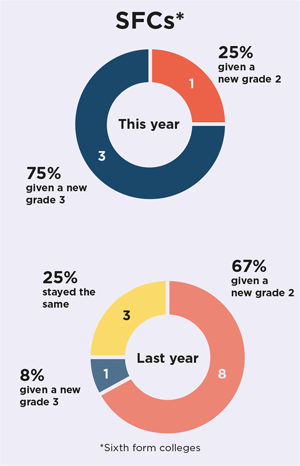 Of the 37 ILPs inspected and reported on this year, 30 per cent got a grade three — up from 17 per cent out of 29 the year before. 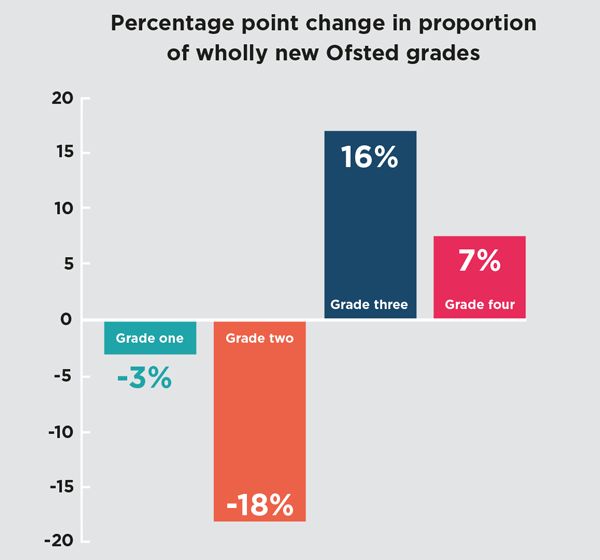 Association of Employment and Learning Providers chief executive Stewart Segal said: “Although the sample of recent inspections is quite small, it does seem that the Ofsted benchmark has been raised and a greater proportion of all providers are getting a grade three than last year. We have said for some time that the pressure on funding in terms of overall budgets and the fact that funding rates have not even kept pace with inflation means that it is really difficult for training providers to get grade one or two. An Ofsted spokesperson said: “We would caution against reading too much into inspection outcomes for such a short period. The figures show providers inspected between the same periods in both 2014 and 2015 where the report was also published within that period. 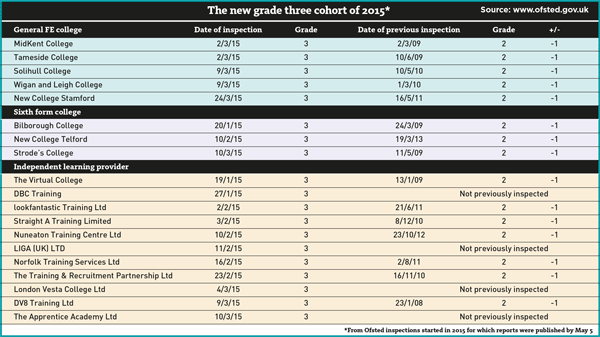 They do not show providers inspected before January where the report was then released between January and May. What does a grade three mean for providers? Up until 2012, getting a grade three meant Ofsted saw you as satisfactory. But since the last change to the Common Inspection Framework (CIF), a grade three means the provider “requires improvement”. And if a provider gets too many grade threes in a row, Ofsted, under the current CIF has the power to brand them a grade four — inadequate. Sliding from a grade one or two to a three also means the provider will no longer be eligible to take on new traineeships as a prime contractor — and also barred from the direct recruitment of 14 and 15-year-olds. But a new, unified CIF, providing one framework for inspecting nurseries, schools and FE, is due to introduced from September. And, as the unified CIF requires all grade two, or good, providers to be re-inspected at more frequent, three-year intervals, the opportunities to slip into grade three status will come around more often.